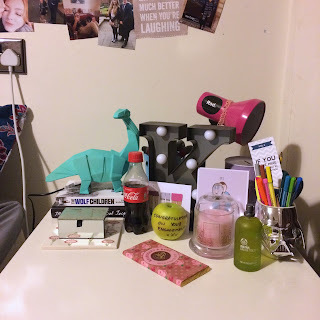 The Lilac Scrapbook: What's on my bedside table? Let's face it, mine (and Sam's) room doesn't stay tidy for long enough to do a room tour - so I'll stick with showing you little bits, like my wall collage. So if you wanna know what's on my bedside table, here you go! My bright pink desk lamp is from eBay and was around 7 quid, and it does the job; the Rad sticker on it came with my Bowie t-shirt, and for some reason there's a Primark choker on there too. To the left is an IKEA plant pot which has a little rat teddy in it, which is actually Sam's, and in front is my 'K' carnival light from Rocket & Rye, which everybody got at #NWmeet in 2015. The silver Darth Vader mug full of pens is from a NerdBlock, and I have a Frozen money tiny hiding somewhere behind it, too, which I got in Poundland - all my tips from my new bar job will be going in there, to convert into dollars when our trip to Boston rolls around! I've got a Body Shop eau de toilette which acts as a room spray, and a gorgeous Baylis & Harding cloche candle from their pink prosecco & cassis range which smells AMAZING. The two pieces of artwork are from HelzIllustrates on Etsy and I literally adore them - I can't wait for the return of Stranger Things, and I'm all about hairy legs because I'm lazy AF. The cute little congratulations apple is from Mike Douglas via Message on a Mango, and is probably the best thing I've ever seen in my life. 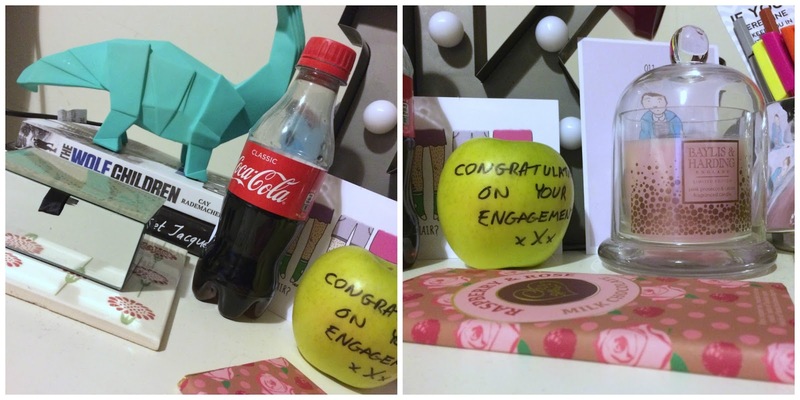 I always have a snack on my beside table, too: currently some Choc Affair chocolate from the mother's day Sweet Bella Gifts box, and a little bottle of coke. At the back are two books, both of which I'm reading along with about 4 more. I've got Trans: A Memoir by Juliet Jacques, and The Wolf Children by Cay Rademacher, which isn't out yet and I'm so excited to review it on here. My current pride and joy, unsurprisingly, is this dinosaur origami lamp from Red Candy which I'm obsessed with. 10/10 would recommend. So cute. Last but not least: a floral tile from B&Q which often acts as a large coaster, and a little glass trinket box that holds all my foreign coins. Of course, this is my bedside table when it's tidy - it's usually a breeding ground for bottles of pepsi and half-used PocketBacs.